Though endodontic procedures are intended to help save your tooth, this is not always possible. Often, the only alternative to endodontic treatment is extraction of the tooth. Missing teeth can make 1 you self-conscious, affect your ability to bit and chew, cause other healthy teeth to shift and have a negative impact on your overall health. For these reasons, the extracted tooth should be replaced with an artificial implant. Dental implants provide a good alternative for the natural tooth when it must be extracted. Replacing a missing or diseased tooth with an implant has several advantages, they are natural in appearance, they don’t require dental procedures on neighboring teeth and they are reliable. Though nothing looks, feels or functions exactly like your natural tooth, dental implants are a viable alternative to help you maintain a beautiful smile. Implants are a state-of-the-art replacement for missing teeth. 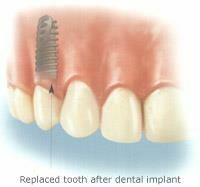 A dental implant is an artificial tooth root placed into your jaw to hold a replacement tooth—the crown—in place. The implant emulates the shape of the root and is usually made of titanium and other materials that are well-suited to the human body. 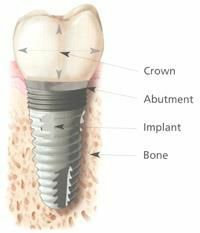 The implant is surgically place into the jaw and incorporates into the bone over time to become a stable base for crowns. Dental implants have been used for several decades by patients of all ages. They can replace a single tooth, several teeth or support partial or full dentures. The way implants are placed depends on the patient, the type of implant and the tooth being replaced. Some implants can be fully place in one day. Most implants involve only a minimal number of steps. 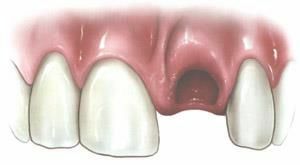 Placing the new tooth: In the final step a crown that has been made in the right size, shape and color to match your natural teeth will be attached to the implant post.